Dating isn't easy – just ask Dr. Nerdlove. It's a lot easier if you've got common interests to break the ice with and get the conversation flowing. In Japan, there's anime. There's also one of Japan's most popular games. "Machicon" is a relatively recent phenomenon in Japan. In order to help stimulate awareness and jump-start local communities, massive group blind dating events are held. The groups can number anywhere from 100 to 3,000 participants. They gather in specified areas and enjoy the local restaurants and bars together at a discount. Some are themed to allow people of similar tastes and hobbies to gather where they know others share the same interest. 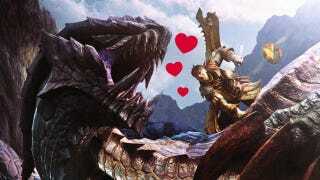 Karikon is a dating event focused on Monster Hunter fans. The event is a collaboration between the dating site, Machicon, and Monster Hunter developer Capcom. In Japan, Monster Hunter is extremely popular among both male and female gamers, so there's a relatively healthy gathering of both genders. The first Karikon was held in January, and a second in May. A third is scheduled for August 18th, and will be held at the Monster Hunter 10th anniversary fair in Shibuya. Due to the size of the event location, only 150 people can enter for the third event. You can see a picture from the previous event below. Participants must be single (of course), over 20 years of age, are required to bring a Nintendo 3DS, an AC adapter, and a copy of Monster Hunter 4 (of course).